There are some breweries in town that you just associate with certain styles of brewing, or at least it feels that way to me. So, I was happy to learn that Civil Life Brewing was bringing back a beer that surprised me when I first had it back in 2017. 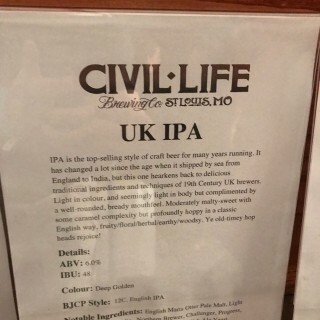 It was the first IPA I had had at Civil Life and I loved it. I was surprised because IPA isn’t a style I would commonly expect from the south city staple. “We are not known for brewing IPAs, but when we have them, they sell fast,” wrote Dr. Patrick Hurley on the breweries website. “Our UK IPA is firmly grounded in our love of classic English beer styles. This IPA will challenge your definition of what an IPA is or should be. Where you expect fruit and pine, in an IPA, here you’ll get a balanced hop bitterness against a solid malt body. “Our secret blend of English hop varieties imparts a woodsy spice with notes of stone fruit. It’s so smooth and easy drinking you won’t believe it’s 70 IBUs and 6% ABV,” writes Hurley.